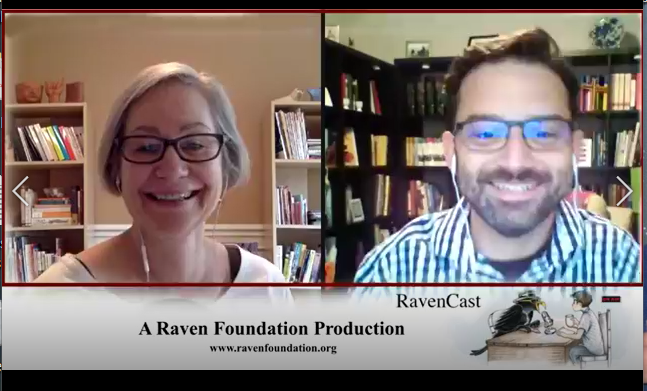 In this episode of the RavenCast, Suzanne Ross and I discuss Islamic holy month of Ramadan, Islam, and mimetic theory. You can watch the video of the conversation below, listen to the MP3 above, or you can subscribe to the RavenCast on iTunes, Stitcher Radio, or Podbean. Ramadan is a holy month of the Islamic year. The Quran was delivered throughout the Prophet Muhammad’s ministry during the month of Ramadan. There is an Islamic tradition that claims all holy scriptures, including the Hebrew Bible and Christian Testament, were delivered during the month of Ramadan. This is part of what makes Ramadan the holiest month for Muslims. During Ramandan, Muslims who are physically able fast from dusk to sunset. The fast is to help Muslims get closer to God and closer to those who are vulnerable from lack of food. This identification with the vulnerable is to lead Muslims to identify with and care for those on the margins of culture. The time before Muhammad is known as the Jahiliyyah, or the Age of Ignorance. People were ignorant about God. During the Jahiliyyah, people believed in a high god, named Allah, that lived far away and didn’t care much about world affairs. There were intermediaries between the world and the high god. People could pray to these intermediaries, who would then send prayers to the high god. But the high god remained uncaring. This theological system supported the status quo. One of the intermediaries was known as Time. Time set up the world the way it is. So, if you were poor or oppressed, Time set it up that way. If you were rich and successful, Time set it up that way. And there was nothing you could do about it. Muhammad saw the oppression that this theological system caused. Soon, he received revelations from Allah. Part of the revelation was that Allah is not somewhere else far away and indifferent to world affairs. Rather, Allah is present in the world and cares deeply about the poor, weak, and oppressed. Muhammad’s mission was to transform a theological system that supported the status quo. He was born into the Quraysh tribe, which was the most powerful tribe in Arabia. When he confronted the leaders, they tried to kill him. But during his time in Mecca, Muhammad responded to the violence against him with nonviolence. Many Muslims, including Abdul Ghaffar Khan, Rabia Haris, and many others, claim that Islam calls Muslims to nonviolence. Islam and Mimetic Theory: A Return to the Archaic? In his book Battling to the End, René Girard stated that Islam might be a return to archaic religions. For Girard, an “archaic religion” is one that formed from ancient sacrifice. Mimetic theory states that ancient human groups suffered from internal conflicts, a war of all against all, that destroyed many ancient communities. The war of all against all eventually turned into a war of all against one. The community united in accusation against a single victim who was blamed for all the community’s problems and then sacrificed. The sacrifice brought a temporary sense of peace. The victim, who was seen as the source of all their problems, was now seen as the source of peace. Girard postulates that the community divinized their victim, who was now a god. Because the victim is seen as the source of violence and the source of peace, the god is seen as the source of violence and the source of peace. In contrast, revealed religions do have elements of the archaic sacred within their sacred texts, but what makes them a revelation is that they have the elements only to deconstruct them with the true God who is only love, mercy, and who only desires peace. When it comes to Islam, those involved with mimetic theory shouldn’t be surprised if there are elements of the archaic sacred within Islam. The question is whether those elements are deconstructed by a revelation of the true God who only desires love, mercy, and peace. Islam does deconstruct the archaic sacred through its fundamental theological concept, Tawhid. Tawhid refers to the “Oneness” of God. Islam scholar Michael Sells states that Tawhid means that God has internal consistency. God oneness means that there can be no conflicting wills within God, otherwise the Tawhid of God is broken. God’s Tawhid is Mercy. 113 of the 114 chapters of the Qur’an begin with the phrase, “In the name of God, the most Merciful, the most Compassionate.” These are the reading instruction that the Qur’an gives to us in order to interpret the Qur’an. The Qur’an tells us to read it through the lens of mercy and compassion. That’s because God is Mercy and Compassion. Far from being a return to archaic religions, Islam is a critique of archaic religions. The opposite of archaic religions are revealed religions. For Girard, Judaism and Christianity are revealed religions. Islam, especially because of the theological concept of Tawhid, is also a revealed religion. Theologically, it reveals that God’s oneness is based on mercy and compassion. Anthropologically, it calls us to a life of mercy and compassion for all people, and especially for those who are scapegoated by the dominant culture. Thank you for this peace-bringing talk and article.